PlayStation owners around the world were treated to a Blu-ray Disc Profile 2.0 update in firmware 2.20, which enabled the special features of BD-Live titles on the PlayStation 3, but outside of the U.S. that really didn't mean much...until now. Sony Pictures Home Entertainment have found a way to make you buy Men in Black again as they announce the Will Smith / Tommy Lee Jones sci-fi classic (is it too early?) as the first BD-Live release for the international market. "SPHE is delighted to bring BD-Live to International markets for the first time," stated Matt Brown, EVP, International, SPHE, "This follows a successful launch in the US in March and is just the start of the exciting possibilities that will soon be available on high definition Blu-ray Disc." Interactive features include a BD-Live multiplayer interactive trivia game and exclusive downloadable theatrical previews. Finally, interactive trivia on Blu-ray. Hopefully they'll be kicking things up a notch with future interactive releases. 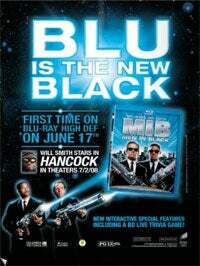 Men in Black the You Might As Well Buy It Again On Blu-ray version will be out June 17th. London, (06/05/08) - Sony Pictures Home Entertainment (SPHE) announced today that it will launch its first BD-Live enabled Blu-ray title outside the US market, with the release of Men In Black in selected international territories* beginning 16th June 2008. This release follows the recent Blu-ray Disc Profile 2.0 software update for PLAYSTATION®3 (Version 2.20), which made the PS3™ the first Profile 2.0 Blu-ray player available on the market. Blockbuster hit Men In Black will bring network connected features to international territories for the first time. These features include a BD-Live multi-player Interactive Trivia Game, as well as exclusive downloadable theatrical and home entertainment previews and a FAQ about BD-Live functionality. Men in Black follows the exploits of agents Kay (Tommy Lee Jones) and Jay (Will Smith), members of a top-secret organization established to monitor alien activity on Earth. The two MiB find themselves in the middle of the deadly plot by an intergalactic terrorist (Vincent D'Onofrio) who has arrived on Earth to assassinate two ambassadors from opposing galaxies. BD-Live allows consumers to experience a variety of network connected options. In addition to exclusive content, BD-Live titles can enable an exciting slate of next generation possibilities, such as ring tones/wallpaper downloads, peer to peer interactions, live events and gaming activities. BD-Live titles are compatible with the latest Profile 2.0 BD players. These models also support Blu-ray's "Bonus View" picture-in-picture feature that was available on previous Profile 1.1 BD players.